Sanjiv Gossain on what companies can learn from penguins about success in a hostile environment. Einstein said specialisation is for insects but, according to a report published last week by the Proceedings of the National Academy of Sciences, it is also the realm of the penguin. 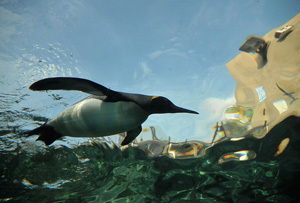 In fact, that is the key to its success; penguins are so numerous because instead of diversifying, they have specialised in two key areas: they are excellent swimmers and catchers of fish – it is the only way they are able to eat the amount of calories necessary to survive in the Antarctic. One might think penguins would be even better hunters if only they could fly as well as swim, but scientists have discovered that they are such excellent swimmers precisely because they cannot fly. Apparently, it is fundamentally impossible for a bird to be good at both. As The Times noted in its discussion of this findings, the opposite of a penguin is a cormorant – a bird that both swims and flies, but does neither very well. As such, it cannot live in the harsh Antarctic, but is confined to more temperate locales, like the South China Sea. Reading this, I was struck by the similarities between the circumstances of the penguin’s success, and the situation businesses find themselves in in the UK today. Like the Antarctic, today’s frozen, hostile business climate has slim pickings for those who would seek to grow and prosper, but specialist skills and a clear focus make it easier to take the opportunities that do exist. This is true for what a company does, as well as how its employees go about doing it. Technology is developing so quickly that it can completely reshape traditional industries, and even create new ones within the space of a few years. Such change, however, brings opportunity, and companies that can adapt will gain a bigger slice of the meagre economic pie. Opportunities for innovative companies are created constantly, but capitalising on them means identifying a niche quickly, and bringing in new skills and knowledge to help the business adapt to a new trading environment. Incidentally these do not have to come from outside the organisation, and there is much that can be done to foster a culture of learning and innovation amongst existing employees. In industries where technology has not yet had a transformational effect, it is nonetheless vital to adapt to new ways of doing business. Even in relatively slow-moving sectors, technology can have such a huge impact on productivity that a shrewd adopter will have a significant competitive advantage over its competitors. Social media, the mobile workplace, automated data analysis and cloud computing together offer the potential to give an enterprise such a significant boost to its productivity that it could potentially make the difference between success and failure. Taking that opportunity requires new skills and expertise, but doing so affords a freedom and flexibility that makes it easier to define and defend what a company represents to its customers. Such an approach comes from within, and the willingness to embrace change must be part of the company’s culture. It has always been important to know where your company sits in your marketplace but, in a hostile economy, with markets in constant flux, it is now absolutely vital. Companies that can adapt to the changes in how business is done, strive for innovation and demonstrate the clarity of their objectives are the penguins of business today – to emulate them, business leaders must find the one thing that their business can do better than any other, and work with those who can help them maintain and build on that status.